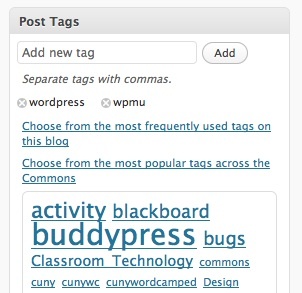 WordPress’s Post Tags box, which appears on each Edit Post and Add New Post screen, has a great feature called “Choose from the most used tags in Post Tags”. This link allows you to see which tags you’ve used frequently in the past and apply them to your current blog post. The feature gives rise to two nice effects. One is that you avoid ending up with a lot of close-but-not-quite-identical tags on your blog (like “WordPress”, “WP”, “Word Press”, and so on) that, because they aren’t grouped together, tend to defeat the organizing purpose of tags. Another benefit is that it reminds you of the things you found important in past posts, and encourages you to mark your current post with the same tags, if relevant. This plugin (and set of hacks) that I’m calling Sitewide Tag Suggestion allows you to glean the same benefits from the tag collection not just of a single blog, but of all the blogs on a WPMU installation. In short: STS adds another link to the Post Tags box, this one allowing authors choose from the entire community’s most popular tags when composing a post. If you’ve got a blog on the CUNY Academic Commons, you can take advantage of Sitewide Tag Suggestion today. Just check out the Post Tags box when you’re writing a blog entry. You can download the plugin here: sitewide-tag-suggestion.php.zip. Detailed instructions for installation – which, partially as a result of my own ineptitude, involves a few hacks to WPMU’s core code – are contained inside of the file. 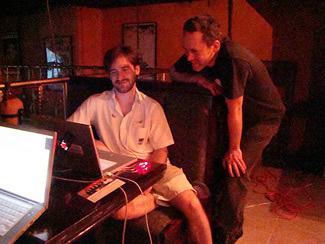 Please note that WPMU 2.8+ is required, as is Donncha’s Sitewide Tags plugin. BuddyPress comes with several WordPress widgets, among which are the Groups and Members widgets that you see on the CUNY Academic Commons home page. This plugin makes those widgets a little more customizable, allowing users to specify which of the three tabs (Newest, Active, or Popular) they’d like to be each widget’s default view. If you’ve got a blog on the CUNY Academic Commons, you can start using this feature right away. Just look in Dashboard > Appearance > Widgets. Be sure to select the Groups/Members widgets whose descriptions say “Enhanced”. You can download the plugin for use on your own installation of WPMU/BP here: enhanced-buddypress-widgets. It’s also available from the WordPress plugin database: http://wordpress.org/extend/plugins/enhanced-buddypress-widgets/. Boone Gorges, who is familiar to many of you as the homegrown rising star of our development team, recently traveled to Vancouver to take part in the Open Ed 2009 conference. From what I’ve gathered, Boone’s flights to Canada and back went relatively smoothly. Boone ended that post by stating his commitment to writing more frequently on this development blog about the smaller issues of development. But his larger point — that those of us developing open-source educational platforms need to communicate more regularly with one another — is one that can’t be emphasized strongly enough. And so, I will close this post with one of Boone’s central questions: “What are some good ways to get this kind of sharing moving?” His post, along with this one, represents a start, as does the revival of UBC’s development blog. But we need to build more lasting channels of communication soon, lest we miss some important connections.